MP Olena Sotnyk calls for concerted voting without formal unification. MP Olena Sotnyk (Self-Help) has brushed off the Petro Poroshenko Bloc's calls for the reunion of the coalition as an "empty phrase". 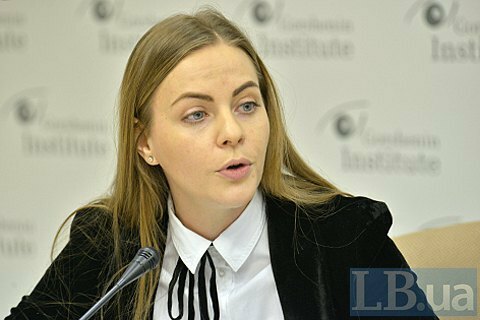 "I think this is an empty phrase because the former coalition partners clearly do not follow the common goals of public policy," she said this at a Gorshenin Institute roundtable on 6 January. "It all led to the collapse of the coalition. If our colleagues want to join efforts, we have ideas worth rallying around. There is no need to knock together artificial coalitions, let's just work together," she said. To start with, the lawmaker suggests that parliament officially recognize the temporary occupation of certain areas of Donetsk and Luhansk regions and Russia's aggression. "At first, we called them militants, then terrorists, now the Russian-hybrid-terrorist troops. Why? We should clearly tell everyone that this is Russia's aggression, that this territory is occupied by the Russian Federation," Sotnyk said. Another issue that Sotnyk believes can unite MPs is an embargo on trade with the aggressor country. Sotnyk also pointed out to the lack of respect on the part of large factions. "When there are no guarantees for consensus, such unions cannot exist and are doomed to fall," she said. Self-Help withdrew from the coalition in February 2016.